In August, the shutters will come down for the last time on a garage in Westport, Co Mayo. The Breheny family business has been operating in the town since 1854, withstanding World Wars, the battle for Independence, several recessions and the pressures brought by the information superhighway. But the fourth generation of the family have now decided to call time on one of the region’s oldest businesses. Someone making scented candles should patent the smell you get when you walk into a garage. The olfactory assault from a combined mix of grease, petrol, sparks and tyres has some kind of capacity to transport you back in time. It’s the first thing that hits you when you walk into the door of the Breheny brothers’ garage on Castlebar Street in Westport. An instant later, the voyage through the years continues. A now almost empty display area reveals ancient wooden fittings. The old fusebox by the entrance stands as a relic of a bygone age. In two compact offices, papers, furniture, stickers and ledgers vie for space with the original blacksmith’s stool, that first graced this patch of real estate in 1854. There’s just one concession to the present: An A3-sized notice, taped to the internal office window. On it, concise detail - "After 164 years of service to the people of Westport, J.P. Breheny & Sons Ltd. will close its doors, as and from August 31, 2018." The poster, signed by Charles and Stephen Breheny, signals the end of several eras. The brothers - aged 72 and 69 - are retiring, selling up and moving on. Their decision brings to an end more than a century-and-a-half of mechanical activity at the same location. The business was established by their great-grandfather and his son, after they moved north from Tuam a few years after the famine. Initially operating as a blacksmith’s forge, it evolved in line with transport trends to provide traps and carriages in the years that followed. The popularity of the bicycle in the latter part of the 19th Century saw the family building, selling and servicing bikes before the focus again switched with the arrival of the combustion engine and the rising popularity of cars. 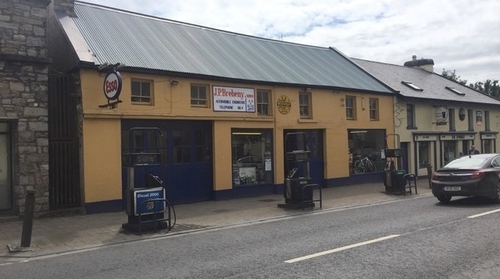 For a significant chunk of the 20th Century, the garage provided the town’s sole petrol station, with fuel initially transferred in jerry cans from Sligo. Such delivery methods were superseded as the years progressed but all the while, motorists pulled up on the street outside the property to fuel up. Even with the tighter safety regulations of recent years, that situation prevailed until just a few weeks ago, when the pumps were finally shut off, in preparation for the closure. The boom in cycling in the early part of this century provided a steady income in the teeth of the last financial crash. But mindful of their advancing years and hoping to enjoy a long, healthy retirement, the brothers decided it was time to call it a day. In keeping with the consistency that’s a by word for their service locally, they’re at peace with their decision. Over a couple of hours this week, the siblings showed us around their garage. It’s a treasure trove of artefacts cataloguing the last 16 decades. The original anvil on which their great-grandfather fashioned horseshoes is one. A short distance away, a Castrol oil dispenser from the 1940s. Stacked on top of shelves, instruction manuals for Hillman cars. Countless enamel signs promoting tyres, wiper blades and oil companies. The workspace is littered with bicycles and their constituent parts. Rusting High Nellies at the back wall. Old Post Office bikes tucked behind an oak wardrobe. And elsewhere, children’s tricycles, newer models along with a range of the latest accessories. The brothers are stoic about the garage closure. The eldest of the pair, Charles Breheny, explains the fast pace of the business world in which they operate. "Nowadays, you’re running to stand still, we kind of strolled along, played it safe…and I think maybe that’s why we lasted." Now, the next phase: "Things change so fast, you have to adapt and get ready for it…and we’re ready" he says. There’s an overriding sense of the family pride in what came before them. In the weeks before he signed the old parchment deeds, passing on ownership, Stephen visited his ancestors’ grave "to get a handle on things". His time there left him in no doubt as to the timing of the decision to retire and the magnitude of what his people have achieved. "They were mighty people, they were better than us.. that’s without a doubt, they were strong, strong people… to move from Tuam after the famine and get set up in a new town. To build the business". As he chats about the future, Stephen is most apprehensive about turning away customers in the coming weeks: "That’s going to be hard, saying no" he admits " We’ve never done that before…"
The service ethos that seems to be part of the Breheny DNA was passed on to those who laboured here over the years. What you sold, you serviced. You looked after people. As the petrol pumps ran dry and the garage was emptied, many of those former employees gathered at the premises last Sunday morning. They swapped stories, caught up on lost decades and remembered the good times they spent under a roof in Westport. There’ve been decades of those days on Castlebar Street. There are a lot of memories across four generations. As Stephen says, "if you let yourself think back, it would be next to impossible". His voice cracking with emotion as he takes in the smells, sights and sounds of a building that will soon lie empty, he concludes: "Whatever tomorrow brings, please God it will be good… what we’re leaving behind was good."